Strangely “Getting Everything You Can” was a book that when I first bought and tried to read it, I didn’t like it at all. Just as with “The E Myth Revisited“, this Jay Abraham book is written from the practical, real world side rather than theory but unlike its title suggests, it is not a “21 steps to take” style book. My advice is to stick with this Jay Abraham book or make sure you come back to it. The key messages are profound. The key issue for me about Jay Abraham’s life work is that it is about having the right kind of mindset. In particular it is about the importance of having what I think of as an “opportunity – possibility” mindset. If you just look around and connect the dots you will see opportunities and possibilities. And if you see them you have a decision to make – are you going to act, are you going to procrastinate or are you going to reject the idea? What Is In Getting Everything You Can Out Of All You’ve Got? This Jay Abraham idea has been adopted and adapted by other people but the simple power of the 3 ways to grow formula is still remarkable because so much effort is focused on the first way at the expense of the other two. There are only 3 ways to grow – sell to more customers, increase the transaction value and increase the number of times a customer buys. Simple. Obvious. But do you have strategies for growing each element. Many people don’t. Jay Abraham tells the story of a young boy who found a coin on the pavement and was so thrilled by the discovering that he carried on searching for dropped coins all his life. Yes he found a small amount of money but he missed so many opportunities to make a fortune. The simple advice is to keep your head up, your eyes open and your mind in gear so you can see the big opportunities in front of you. Just stand back and take a good hard look at your business. You can’t work out how to get to where you want to be without knowing where you are at the moment. Again simple and a cornerstone of my own coaching but it works so well. How do you get to London? It depends on where you are now. That’s common sense but it doesn’t feel so easy when you out a question back in a business context. This is really powerful concept of Jay Abraham that I believe in wholeheartedly. Success comes if you put your clients needs ahead of your own. Act in their best interests and take the high ground. Your customers and prospects will see the difference and reward you. Why? Because you are listening to them and what they really want and need. Calculate the lifetime value of your customers and the marginal net worth (lifetime value less the costs of acquisition). It will give you a new way to look at your customer acquisition process, your client retention strategies and give you renewed enthusiasm for increasing the other two ways of growing your business. Focus on this lifetime value is a major cause of Jay Abraham’s success since he specialises in making established businesses more profitable. Develop and communicate a clear Unique Selling Proposition (USP). Easy to say but hard to do. Jay Abraham gives you examples and advice but I find the biggest stumbling block for business owners is that creating a USP means making decisions and choices. It means focusing on a particular type of customer and targeting them precisely rather than trying to appeal to the general market. It’s the difference between piping hot home made chicken soup and luke-warm soup of the day. Jay reminds us about the about the Claude Hopkins and Schlitz beer story from the 1920s. A struggling small beer maker was able to move to the number 1 position by explaining in detail all the care attention that went into making the beer. “But we all do it like that” said the Schlitz management – “Yes but the public don’t know that” replied Claude Hopkins. This is a classic piece of educational marketing that shows that people can’t value something they don’t know or understand and the principles could apply to your business. Risk free offers and even more compelling, better than risk free offers. Why would anyone do this? Because if your customer carries the risk, they will be nervous about committing. Your customers don’t know how good you are but you do. You can accept that risk far more cheaply and easily than they can. Just don’t do it because it makes you more money (it will) but because it is in the customer’s best interests because they get what they really want. Haven’t you bought something only to learn later that you should have spent a little more to get some key benefits you hadn’t understood about before? Sound advice when you realise that even the best, most experienced marketers and copywriters can get remarkably different results from just changing a headline. Build on your relationships to bring you more customers and more products. Jay Abraham calls this host-beneficiary relationships while Guerrilla Marketers know this as fusion marketing. Prospects from referrals buy more and buy more easily but do you have a process. Jay Abraham has identified 93 referral systems in a Nightingale Conant audio programme. People stop buying for many reasons but many can be easily recovered if you show that you have noticed and that you care. Almost anything can be sold using direct mail and in this chapter Jay gives tips on how to make your letters more effective. Mastering the art of getting clients over the telephone. The book was published in 2000 so some elements of this chapter are out of date but it still contains sound advice. How can you do that? By using barter to make the deal. If you do this, I will do that. It is a simple process for two people although it does get more complicated with three people involved. The more you see them as friends, the closer the bond and the more likely they will keep buying. Using goals as the engine of success. Every coach talks about goals? Well they are important and they have been shown to work. Aim to get the most out of everything you do and keep learning. Look closely and you will find that you have key skills, capabilities, knowledge and relationships that people will value. Jay Abraham goes into this in much more detail in another Nightingale Conant audio called Your Secret Wealth (affiliate link). “Getting Everything You Can Out Of All You’ve Got” is an excellent introduction to Jay Abraham’s thinking and you can buy this Jay Abraham book from Amazon.co.uk or Amazon.com (affiliate links). I give it five stars – an essential read for an ambitious business owner. There are many thousand of business books, you can see the full list of my reviews at Business Books Reviews by Paul Simister (Please click). I've also narrowed these down to a list of the 12 Best Business Books For Business Owners & Entrepreneurs (Please click). Paul Simister is a business coach who helps business owners who are stuck or struggling with disappointing marketing, to get unstuck. You can then start attracting, converting and keeping more customers. If your business is based in the UK, you can have a free 60 minutes Business SOS consultation (please click) with me to get you unstuck. 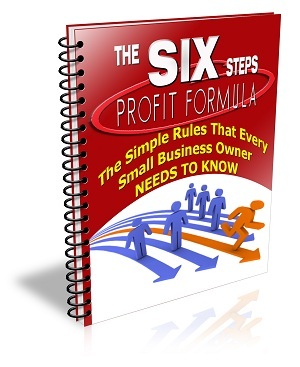 Don't forget to download and read my FREE Report - The SIX Steps PROFIT Formula: The Simple Rules That Every Small Business Owner Needs To Know available to download at Six Steps Report (Please click). This great report has already been downloaded by hundreds of business owners and NOW, you can get read it as well - for FREE! What is the one thing you need most to be successful? It's #1. How can you create a compelling, irresistible marketing message? That's step 2. A small business coach and advisor based in Birmingham, with over 35 years business experience, including more than 20 years as a self employed consultant/coach. Main interests are in marketing, business strategy / planning and performance measurement and how these can be combined to get businesses and business owners unstuck. FEELING STUCK – Have a difficult issue and you need help? Talk to me for FREE. The Six Steps Profit Formula You will also receive other emails to help support you and get you unstuck. What Do Consumers Value When Buying? What Do B2B Buyers Value When Making Buying Decisions? What Happened To Seth Czerepak?